I don’t know what it says about me, but two of my favourite Transformers characters are Ironhide and Kup. The two cantankerous, bashed up old warriors. 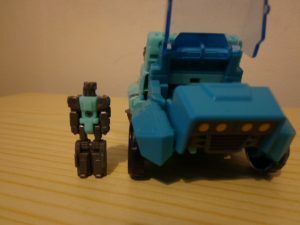 Both have similarities in their characters and both have had some pretty naff toys over the years although Kup can claim to be coming out ahead in that respect, if only by a tiny margin. Ironhide finally got the figure he deserved last year with his Masterpiece release. 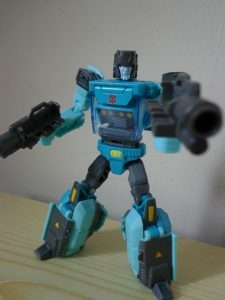 Although I would love to see Kup get a masterpiece toy, I’m excited for what we’ve gotten this year. I’m happy to present Titans Return Deluxe-class Sergeant Kup. 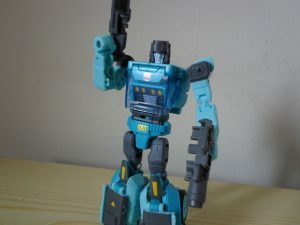 The Generations line produced a fairly good representation of Kup a few years back. I liked it a lot but the vehicle mode wasn’t what we associate with the grizzled veteran. What we got instead was an Earth-mode pick-up. I though it was pretty cool but I longed for a more G1 accurate toy. Lo and behold, Titans Return delivers again. 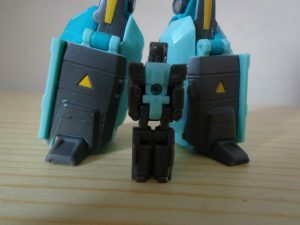 This Kup, while not perfect, delivers exactly what I wanted from a Kup toy. It’s got his classic alt-mode, fairly accurate colours and a cool transformation. There are a few things that spoil it a little for me and they come down to the manufacturing o the toy. The lack of paint is one of these issues. There is moulded detail that would’ve benefitted from a lick of paint. Just a different shade of teal would’ve added a layer of depth. In robot, it’s not so bad until you reach the head. It’s just so bland and a bit of paint would’ve made it pop. Other issues I have involve a few stress marks I have noticed on the toy that were there when I opened it. Particularly around the arm and shoulder joints. They’re only small, but there’s every chance they could get bigger over time. The hips also have the usual Titans Return issue of being too loose and it causes the legs to be a little floppy. No-one likes having floppy legs. Now with the flaws out of the way, lets focus on his vehicle mode. 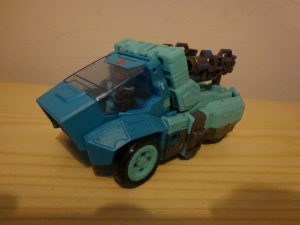 We all remember Kup’s frankly odd-looking alt-mode from the 1986 movie. The best way to describe it would be space pick-up. This is recreated quite nicely here, albeit a little shorter. Could they have made the vehicle a littler longer? Sure, but in the grand scheme of things, it doesn’t really matter. The majority of the G1 minibots were deformed versions of genuine vehicles and no-one cared, so why should they now. The cockpit on this one is quite large and the Titan Master does rattle around in there a bit which is kind of annoying. I’m also not a huge fan of the hollow plastic wheels on this figure. I know they all have them in this line, but they seem more prominent and noticeable on this figure. The truck mode features some handy weapon storage on the back. His guns can peg into the flat-bed. Kup can literally only use the bed for storage unless the guns face the rear otherwise he’s going to shoot off his own arms. It’s still a neat touch. I can always get behind some alt-mode weapon storage. When it comes to Transformation, the techniques used are brilliant. The legs are formed from the vehicles side panels and flat-bed folding up around each other and the result is effective. The feet are tricky to get out without an edged tool or Sabertooth’s fingernails. I was extremely frustrated trying to get them out. The way the chest folds in on itself is some fantastic engineering and creates a suitably box-like and robust chest area for the robot. Kup’s Titan Master buddy is Flintlock. A suitably old-school name to accompany an old-school bot. It’s your standard Titan Master. The grey plastic they’ve used makes it difficult to see the finer detail in the sculpt. This is one that definitely could have benefitted from a little paint. 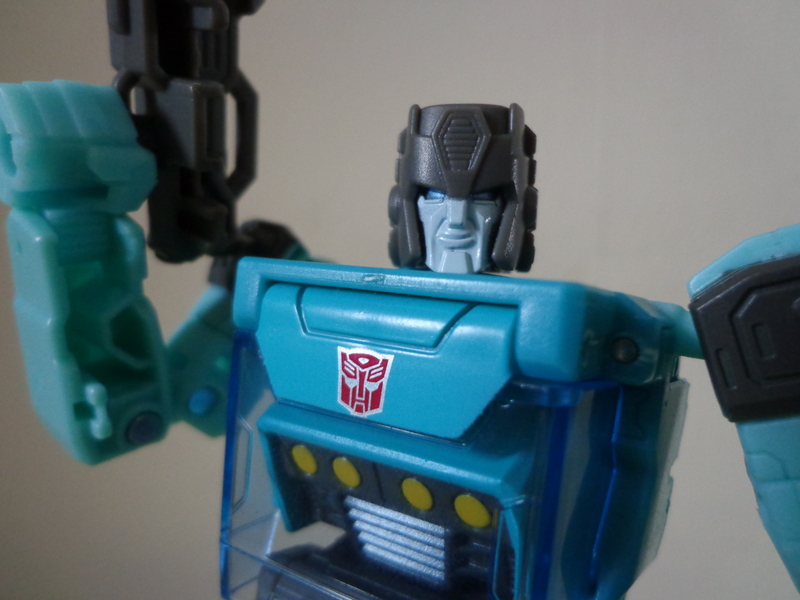 Kup’s robot mode is where it’s at. Admittedly the colours could’ve used some work. 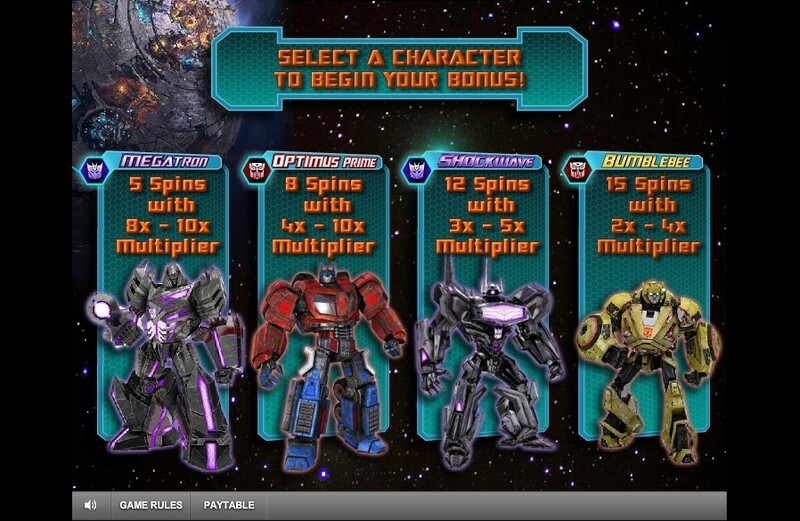 A few extra paint apps here and there would’ve been nice but, hey, this is Hasbro we’re dealing with. Not that I can be too hard on them as they really have impressed with the TR line and hopefully continue to do so. What paint there is looks a little sloppy in places. This is particularly evident with yellow applications. The layer of paint is so thin that the colour underneath is visible. No doubt repro-labels will come up with a fix but they shouldn’t have to. Articulation is fairly impressive as is the standard with Titans Return. We get the full 360 rotation on the shoulders thanks to a nifty ball joint. Knees are soooo close to giving a full ninety degree bend but fall short by a small margin. I put that down to Kup’s cyber-arthritis. Thanks to the transformation, the elbows give a complete bend giving the freedom to give him some pretty badass gun-toting poses. As is fairly common these days, we also have thigh and bicep swivel. I don’t know if they’re actually short or whether it’s just the sheer chunkitude, but his lower legs look stumpy to me. Bit this doesn’t really affect my opinion of what is one of my favourite Transformers of recent years. I would highly recommend picking this guy up. The price is a sticking point but nostalgia won out for me and I had to get him as I’d been looking forward to him. 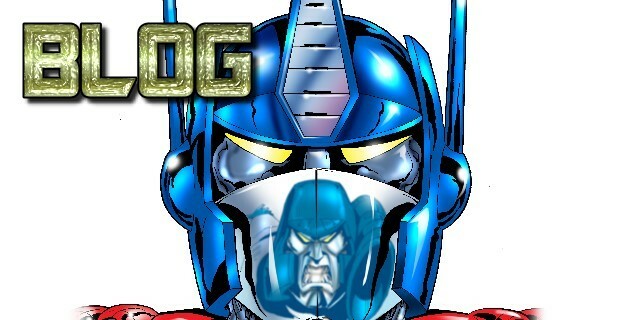 I really have a thing for the grumpy Autobot veterans. And he looks great next to Hot Rod and Blurr from the same line.